Nothing surprising about that maybe – but this is the first significant rain we have had since the beginning of June. Following the torrential and unremitting rain we had in the spring, when I couldn’t plant the potatoes because there was standing water 6 inches down in the soil, we have had a very hot, almost totally dry summer. All the rain-water butts are empty so we’ve had to use the hose to water the veg and the fruit bushes and trees almost daily, heaven knows what the water bill will be. There are great cracks an inch wide and going down to middle earth in the veg plots. So I got up early this morning to do the watering before the heat comes and was overjoyed to feel spots of rain on my face. I think it had rained overnight – the forecast promised that but I’ve stopped believing them – because the grass was just a little damp and the garden chairs had small puddles on the seats. Sipping my morning coffee and with a background of rumbling thunder I pottered around the garden, watered and tidied up the tomatoes in the greenhouse (and picked a few) and decided to harvest the remaining gooseberries. We have 4 gooseberry bushes. (see our Soft Fruit list.) 3 were here when we came 12 years ago, but are under the shadow of two large apple trees, plum trees and the walnut trees. One of these bushes produces a reasonable crop every year, but does suffer from the brown mouldy stuff. That’s maybe because it needs more air and light. A few years ago I took some cuttings and we planted the one which survived and flourished in a new row set between the blackcurrants, along with a couple of jostaberries which some friends gave us. 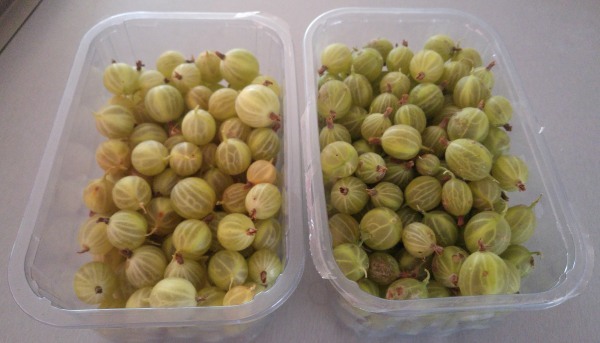 This new gooseberry is doing really well and it’s that one I harvested this morning. I have taken half a dozen cuttings this year, so hopefully will have a couple of new bushes in a year or so. After a slow start the jostaberries produced a few berries last year. This year one bush has died, but the other has provided enough for an apple, loganberry and jostaberry crumble and some to go in the freezer. Jostaberries are like large blackcurrants without the intense flavour, are a little sweeter and don’t have so many pips. On returning to the house with my harvest, the heavens opened and for a while rain poured down. But an hour later, the sun is shining and promising another hot, hot day. 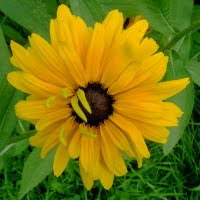 I have found a fellow gardener of my own heart! She seems to have produced a catalogue and encyclopaedia of our garden at www.gardenwithoutdoors.org.uk/weed_guide. This lady takes photos of suspected weed seedlings and records them as they grow and flower, and she takes cuttings of weeds! I found her website when trying to identify a horrible climbing weed that has appeared in our hedge. terrified it was knotweed - but turns out to be black bryony. Not so terrifying but nasty and apparently poisonous, so it's on to the bonfire for that nasty. and appropriately it was a warm sunny spring day. It's the first time we've been able to get out in the garden due to the cold and very wet weather this year. There's been snow even last week, and everything is behind schedule. But this weekend the birds have started singing and things are looking up. Yesterday I planted 60 broad beans - saved from last year's crops - in 12 pots in the greenhouse, and today I planted 48 beetroot seeds, 15 Alicate tomato seeds (favourites - tasty and good croppers) and 10 "Gardeners Delight" tomatoes which I haven't tried before. I noticed from our planting diary that most years I've had the broad beans in by early March, or even February and the tomatoes and beetroots in too. But this year it's just not felt like it was time until now. I have some big pots of Sante potatoes in the conservatory which are now shooting nicely and 3 pots of Desiree up in the greenhouse planted a couple of weeks ago. These are all saved from last year's harvest. I've ordered up some new Desirees (red) and some Pentland Javelins (whites). Today I was able to get started on some of the jobs in the garden. I cut back the raspberries and took out the dead canes, hoed our rhubarb bed - which are all looking pretty good - and started digging over the veg beds. The soil is pretty wet still and the green pipe and waterfall are in full flow.